On September 23, Yards hosted their 4th annual Smoke 'Em If Yous Got 'Em event. The popular event was held again at the brewery, taking advantage of both the brewing space as well as the short street just outside the front door. 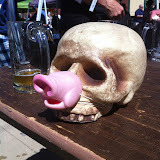 Smoke-flavored beers were the focal point of the event with a supporting cast of great foods and music. Some might say that smoke beers are an acquired taste. While that certainly has not been an issue for the hundreds that have come out each year, for the first time, Yards opened up the beer list to more than just smoke beers. Guest breweries included many of the locals you might expect (Sly Fox, Iron Hill, Stoudt's, Tröegs, Victory, Manayunk, Flying Fish, and Weyerbacher), some newer upstarts (Neshaminy Creek and Old Forge, e.g. ), and a couple of authentics from Germany (namely, Schlenkerla). Outside, the street was filled with both amateur and professional chefs (including Percy Street BBQ and Vernalicious) cooking up their best barbecue. Unlimited helpings of everything from ribs to brisket to sausage were included in the price of admission and judged by guest judges as well as the public for people's choice. There was much pleasing flavor to go around the event from the plate to the glass. However, one particular plate stood out for me. It was The Smoke Team's Suckling Pig stuffed with cornbread and broccoli rabe, then topped with duckfat sauce and duck cracklings. They called it "The Phillington", a classic Wellington with a Philly twist. A tasty twist indeed. In the spirit of me dropping the ball more than is typical of late, I left before Yards owner Tom Kehoe announced the winning entries. So, I really have no idea how this magnificent plate of food fared at the judges' table. I had an early morning flight the following day and the prior day's activities at Sly Fox had already filled the weekend for me. Just another fine day and event at the Yards. If you've not given it a try, consider this fair warning for next September. If you'd like to read and see more from two guys that put in more time at the event than did I, head over to read Ryan Hudak's account at In Search Of Beer and/or Rich Isaacs' account at Rich On Beer.